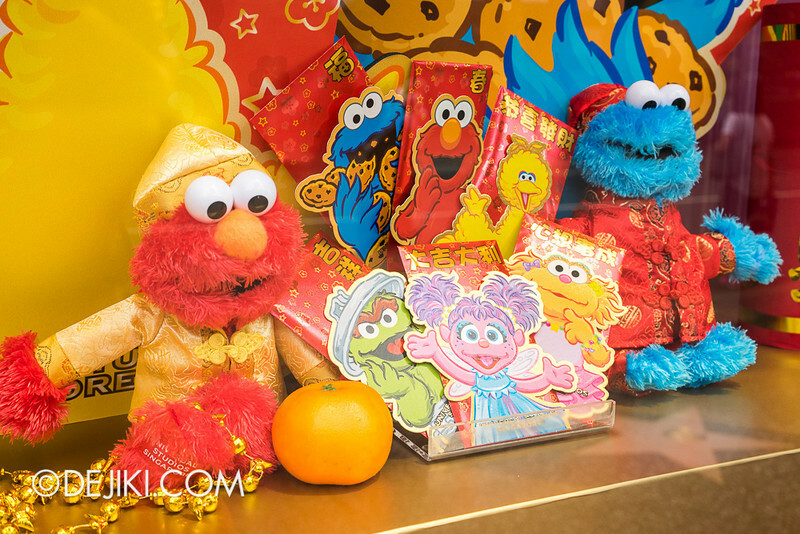 Universal Studios Singapore celebrates Chinese New Year with seasonal park decorations and festive goodies! Find out what’s new at the park in the first update of the year! 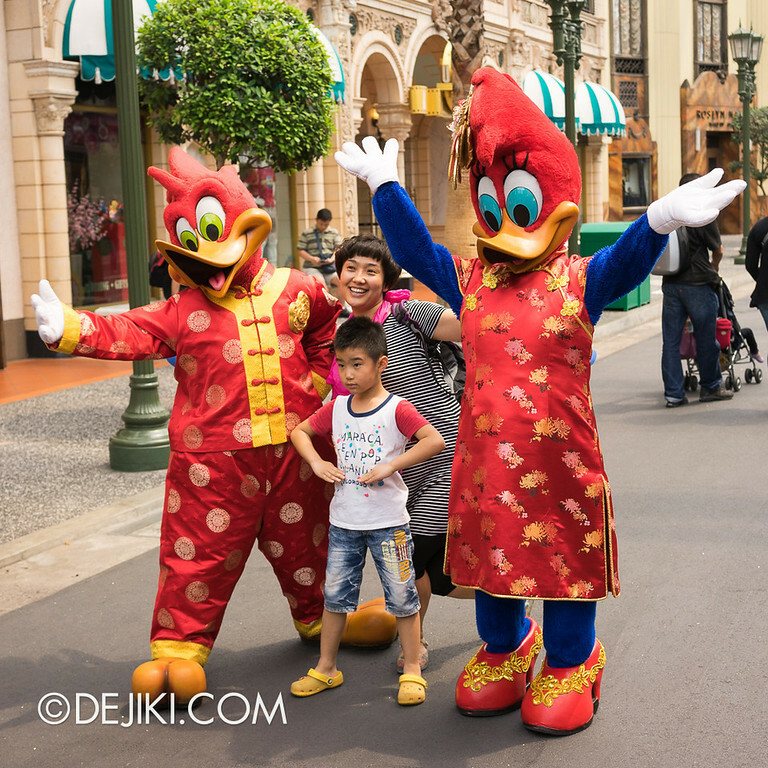 From now till 14 February 2014, the park will be in Chinese New Year mode. Even the ticketing counters have festive greetings. But in the park itself, the decorations this year are simple: several chains of red lanterns along New York and Hollywood. 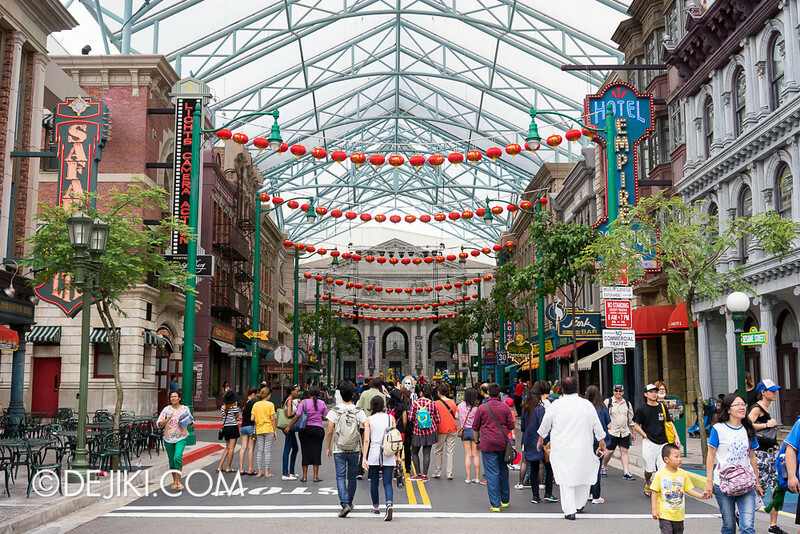 Along with this: Typical Chinese New Year music, like the ones you hear in malls, fill the air in the Hollywood and New York zones of the theme park. The music is disconcerting. It feels like we’re going to the mall..? and not Universal Studios? Another element of seasonal park decor: The Universal Studios Store has a new store display, featuring seasonal merchandise. We’ll go into that later. 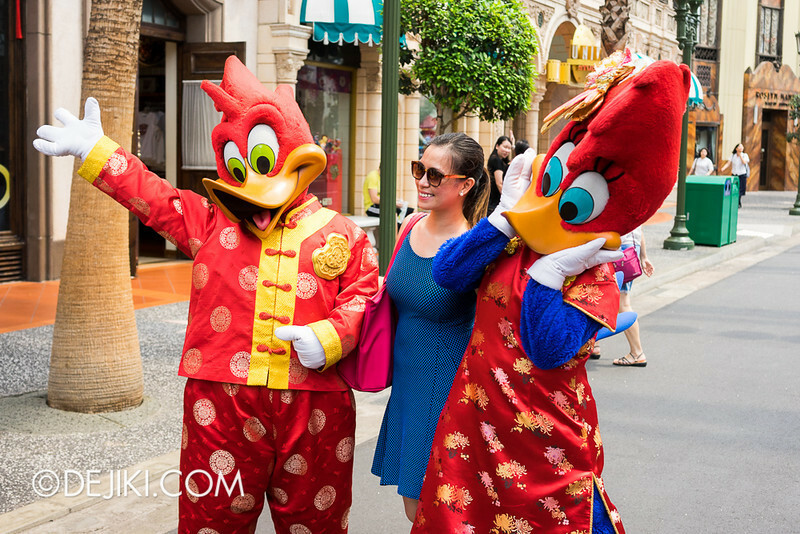 During this festive season, Woody Woodpecker and Winnie Woodpecker will be dressed in “auspicious” outfits. But not your favourite minions! 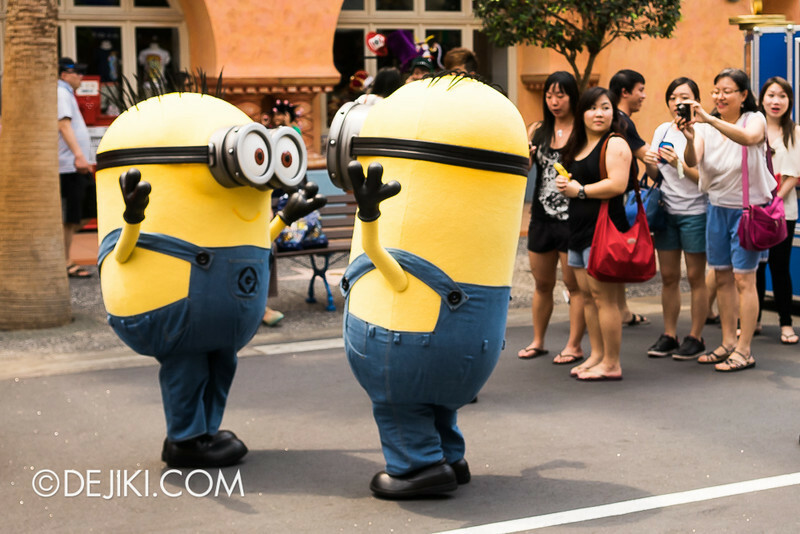 Here’s a tip for anyone interested in meeting the minions. Grab the park’s Times Guide (the white slip of paper next to park maps) when you visit. The the exact appearance times are listed on the guide (but only for minions). 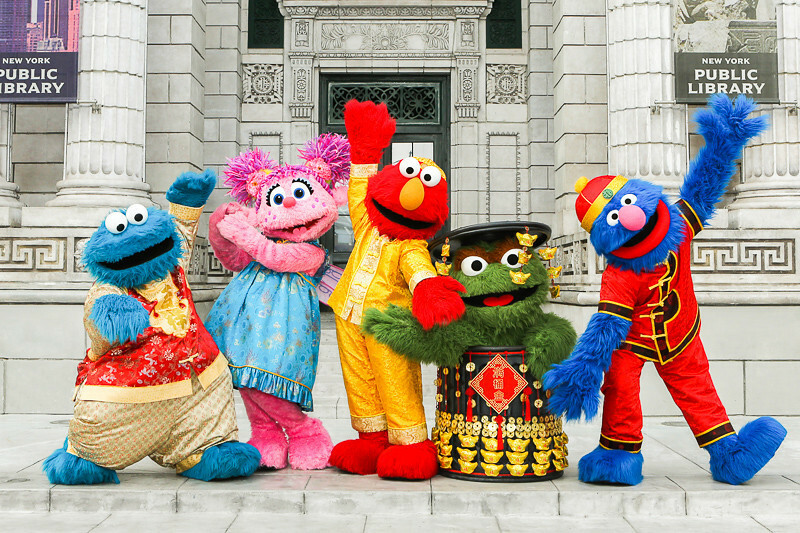 Five Sesame Street characters will also have seasonal outfits. They will only appear like this outside of stage performances. 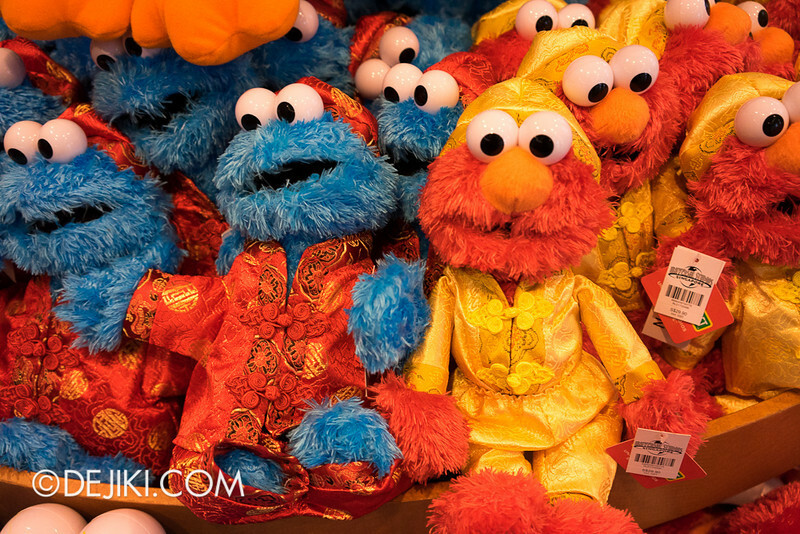 I wasn’t able to wait for all five of them to appear, so here’s a photo from RWS showcasing Sesame Street in Chinese New Year attire. Sesame Street © 2014 Sesame Workshop. 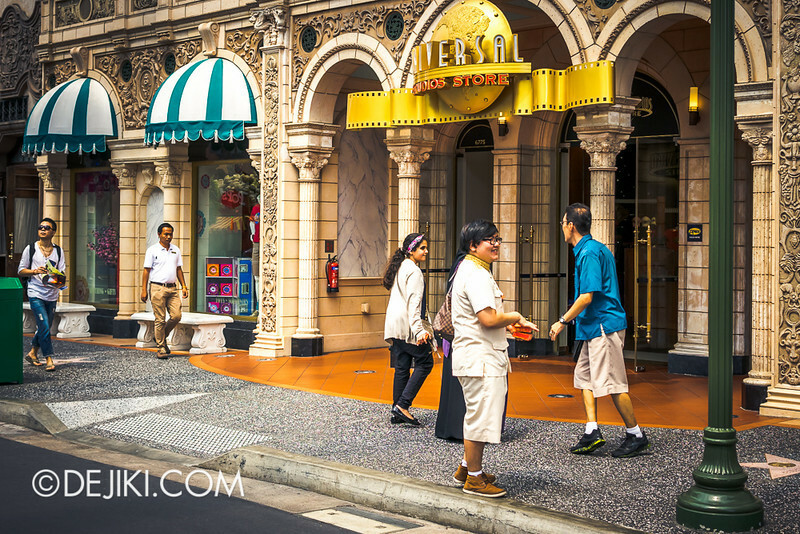 Universal Studios Singapore ® & © Universal Studios. All Rights Reserved. 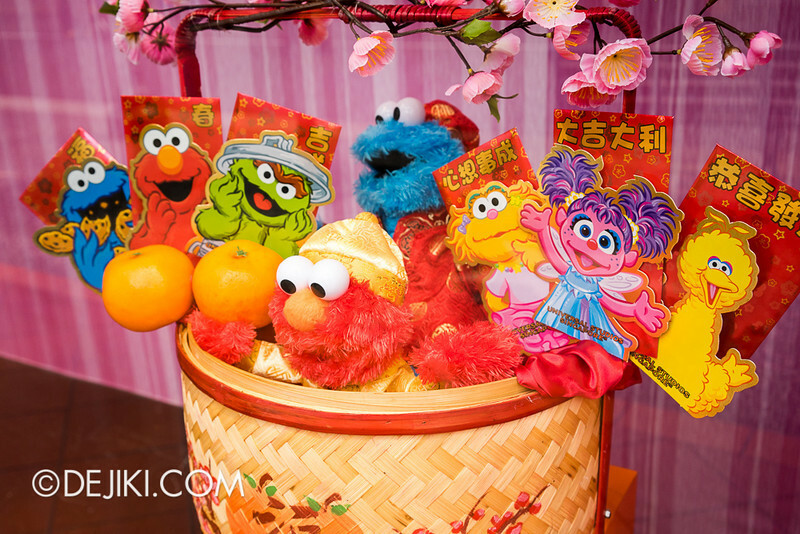 And oh, here is a special Lunar New Year edition of the park guide. 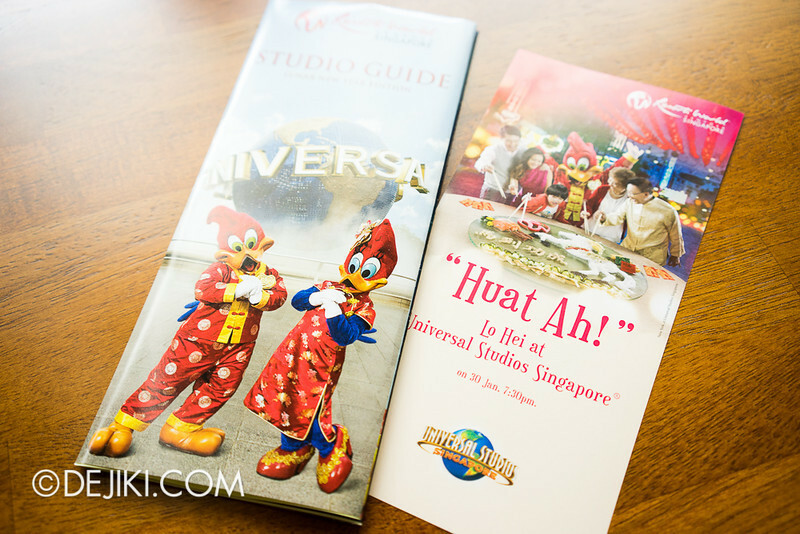 The map remains the same, with just a mention of the Lo-Hei at Universal Studios Singapore event on 30/01/2014. 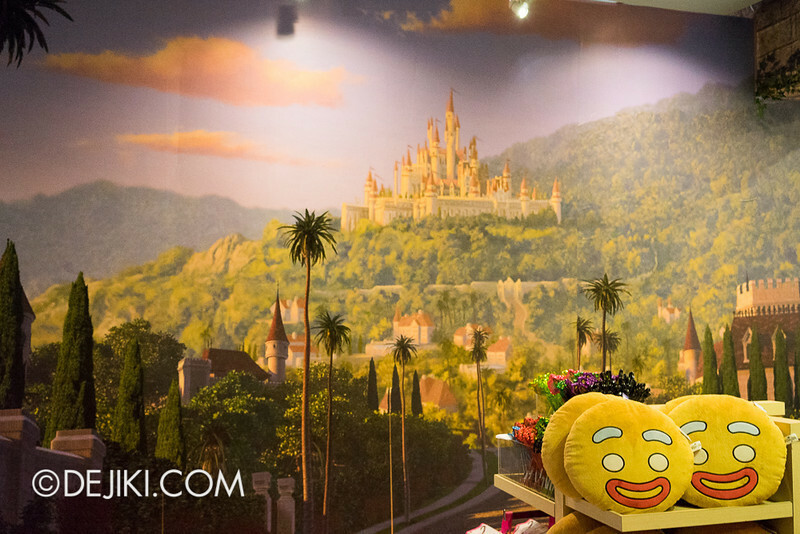 The event is a reunion dinner (banquet) at New York zone in Universal Studios Singapore. Find out more about it here. With a menu designed by the chefs of Feng Shui Inn (Crockfords Tower) and Forest, this certainly is a unique opportunity for a luxurious 团圆饭 (tuan yuan fan; reunion dinner) coupled with three park attractions that will be open for 1.5 hours during the night. 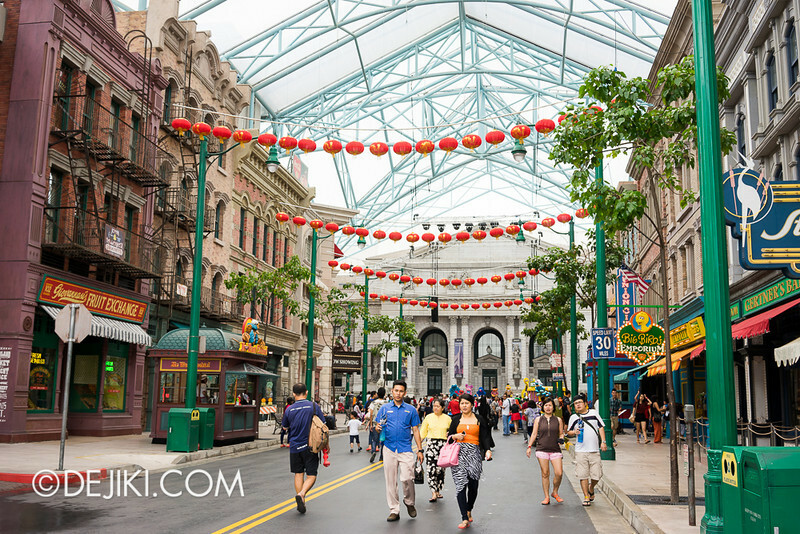 More nights are available for Lo-Hei Dinners at the park, but the line-up does not include dinner at New York street (30th Jan exclusive) and the three attractions will only be open for an hour. 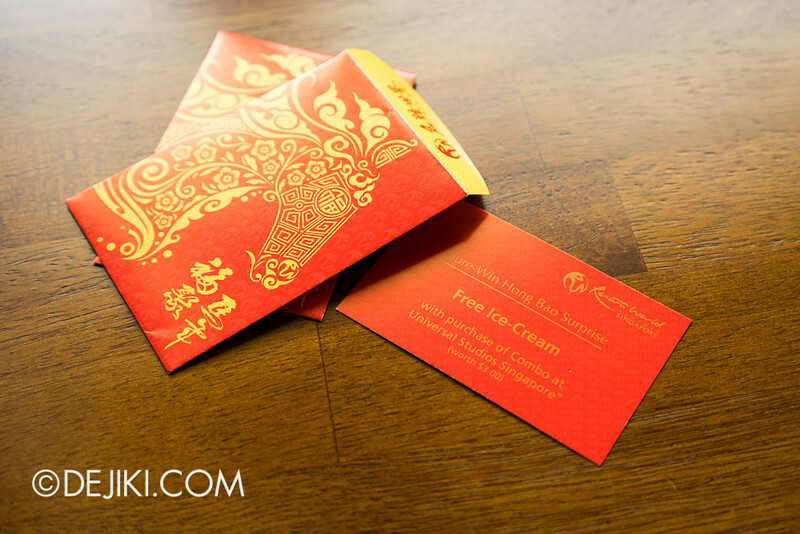 During the festive season, the park will give away red packets (hong bao) as part of a promotion called ” Sure-Win Hong Bao Surprise”. 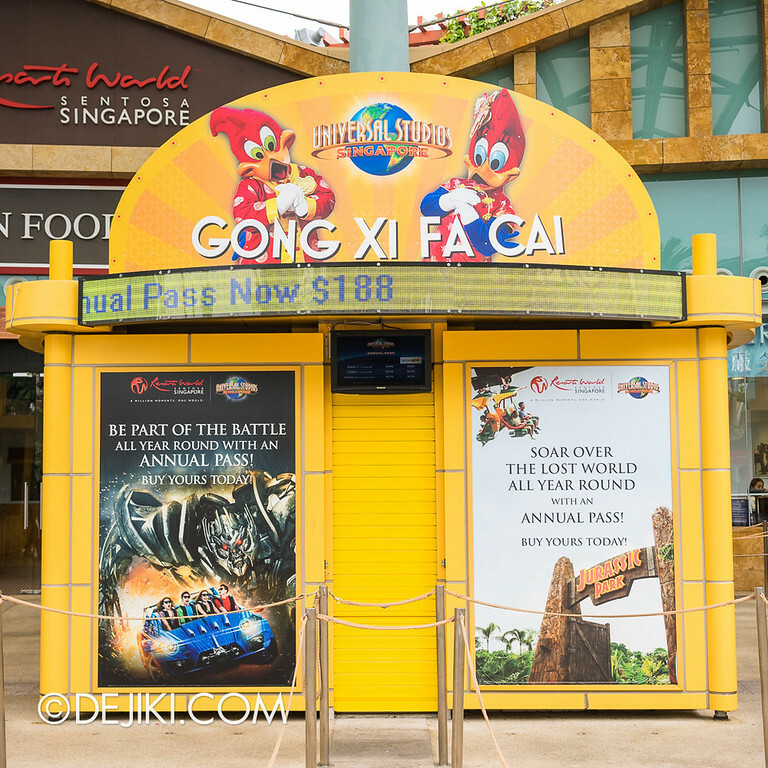 Guests will receive one red packet at the park gates, right after your ticket is scanned at the turnstile. The entire resort is participating in this – that includes S.E.A. Aquarium or Adventure Cove Waterpark during the event period. What can you win? The best prizes will only end up with a fortunate few. For the rest, it’s little treats of discounts or free-with-purchase prizes. I got a “Free Ice-Cream” (with any Meal Combo purchased) coupon. 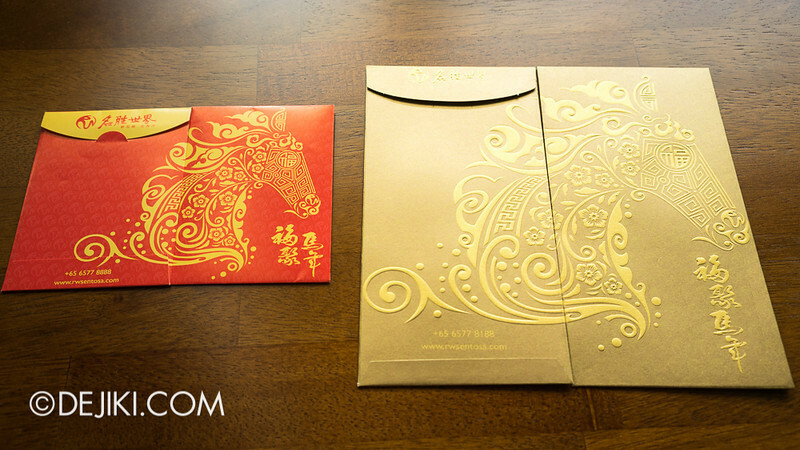 The red packets given this year look much better than last year’s, probably because it’s a variant of another design. It’s also smaller, like those “$2 Red Packets”. The horse motif extends to the back. On the right: Resorts World Sentosa’s luxuriously embossed red gold packets, is probably big enough for $1000 notes. While walking around Hollywood, a crew member gave another one. Still the same “Free ice-cream with meal purchase at USS” coupon. 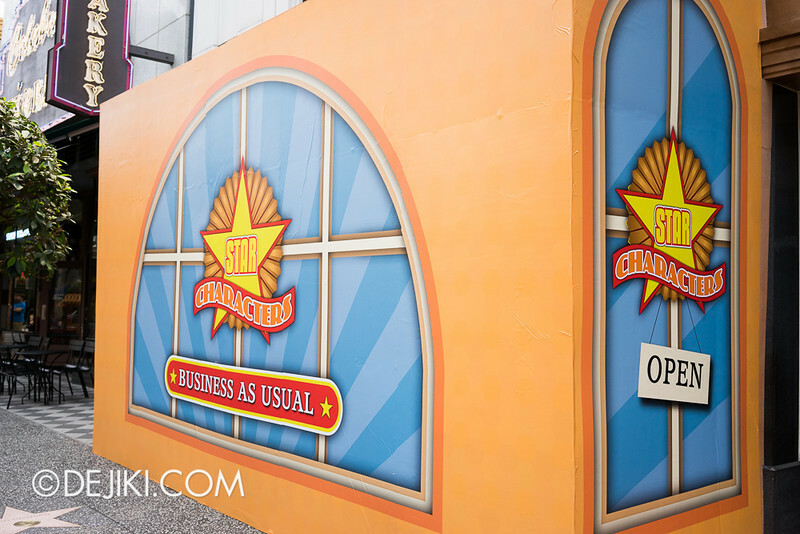 The large store window at the Universal Studios Store (Hollywood zone) is occasionally re-decorated a few times a year. The current iteration is probably the most fanciful so far. 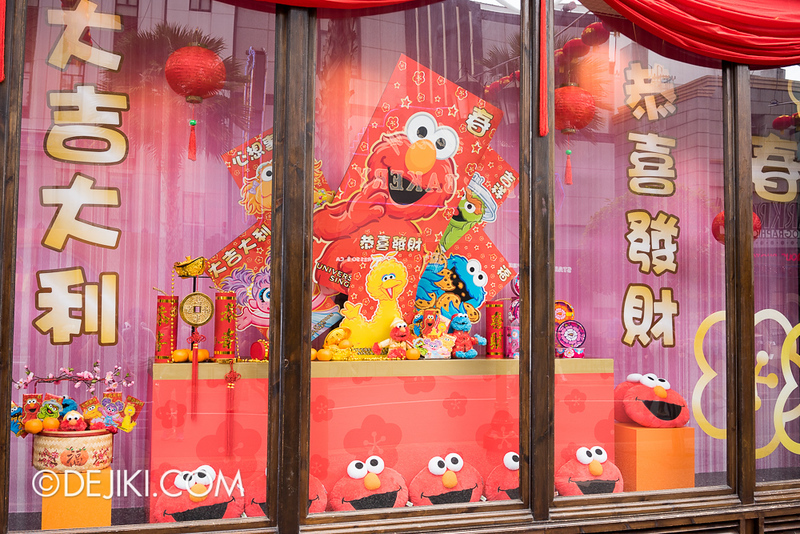 The highlight appears to be the same “Limited Edition” plush toys and Sesame Street red packets (hong baos). 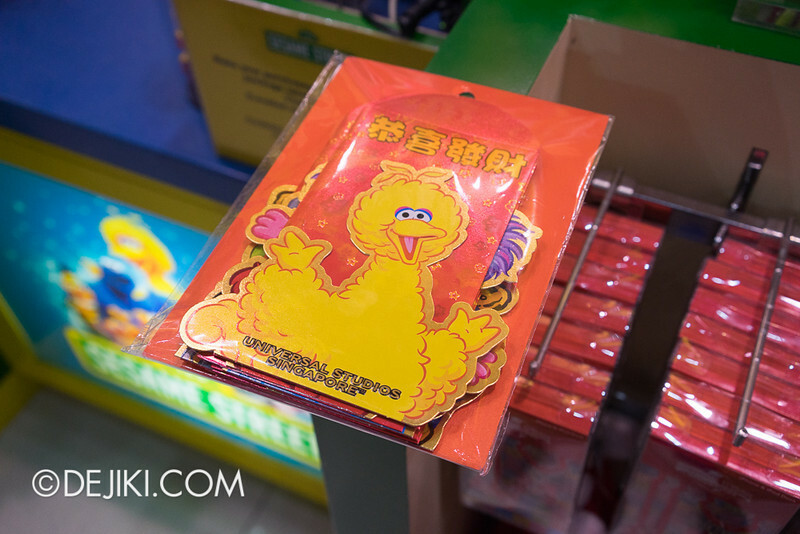 Big Bird – 恭喜發財 – Kung Hei Fat Choy!! 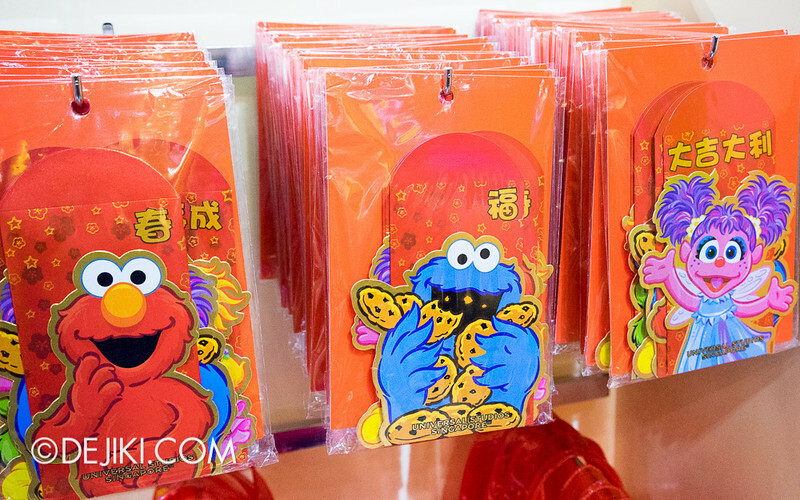 The Chinese New Year Limited Edition Elmo and Cookie Monster plush toys go for $29.90 each. There is a new promotion: 2 plush toys for $49.90 (or around that price). 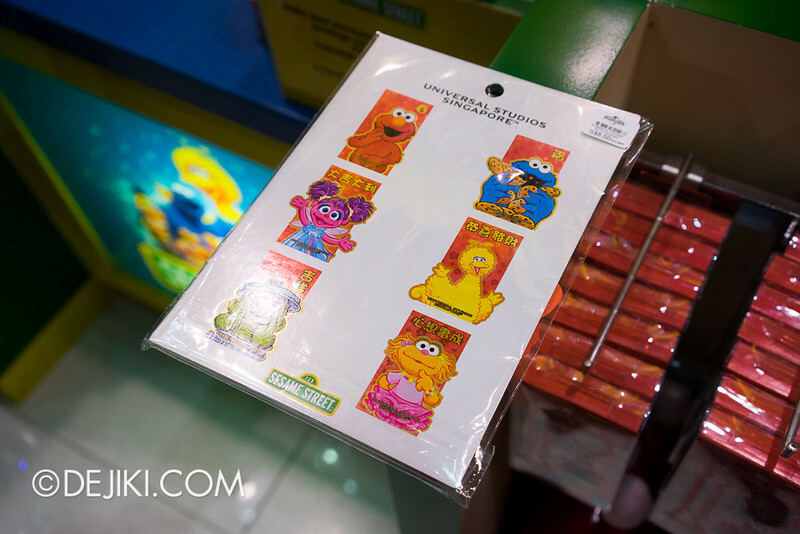 We’re back to the USS-exclusive Sesame Street red packet set again. You can find lots of them at Big Bird’s Emporium (New York zone). 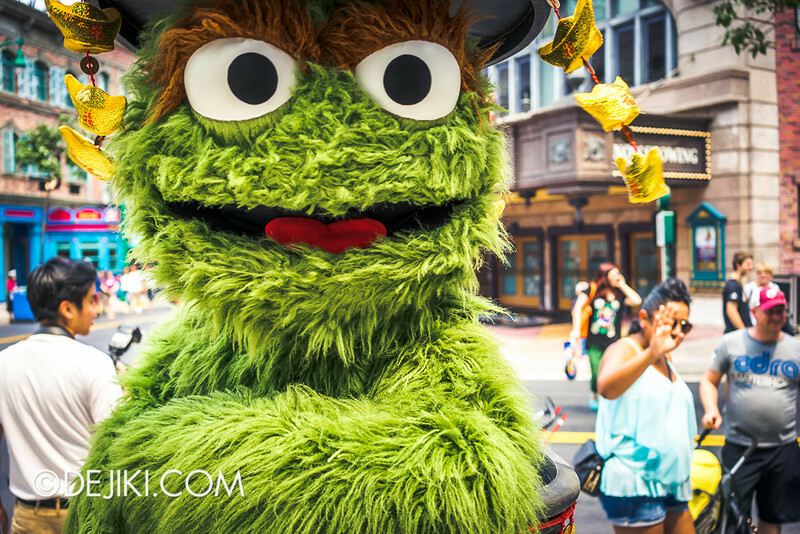 Take your time to decide who gets the Oscar the Grouch hong bao. After Celebrity Cafe and Bakery radically transformed into Starbucks, the neighbour store, Star Characters, is also going through some changes. Inside the store, walls have been put up surrounding the window. The rest of the shop is still heavily themed to Shrek. So it seems to be a new window display. What did the old one looked like – Did anyone remember? It’s exactly six months since the Battlestar incident and the fates of the world’s tallest dueling roller coasters has yet to be decided. BSG is still under attraction review. 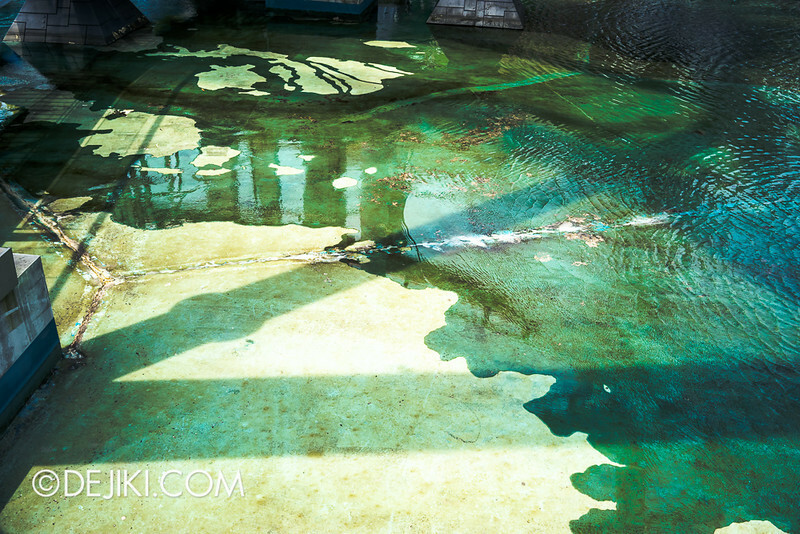 The lagoon below the tracks sadly reflects the state of the ride above. The outdoor section of Oasis Spice Cafe has been cleared of most tables and chairs. Only a couple remain. What’s going to happen here? 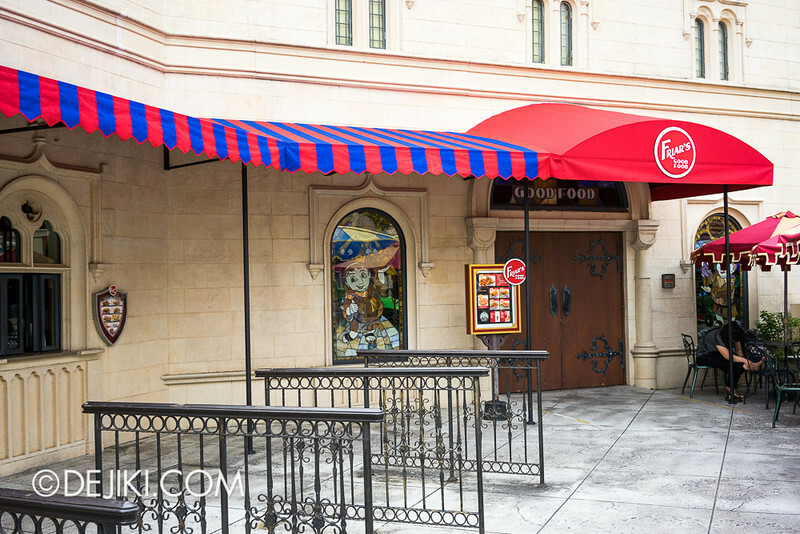 Friar’s Good Food looks a bit different with all the umbrellas taken away, and what looks like new awnings extending into the tiny indoor dining hall. 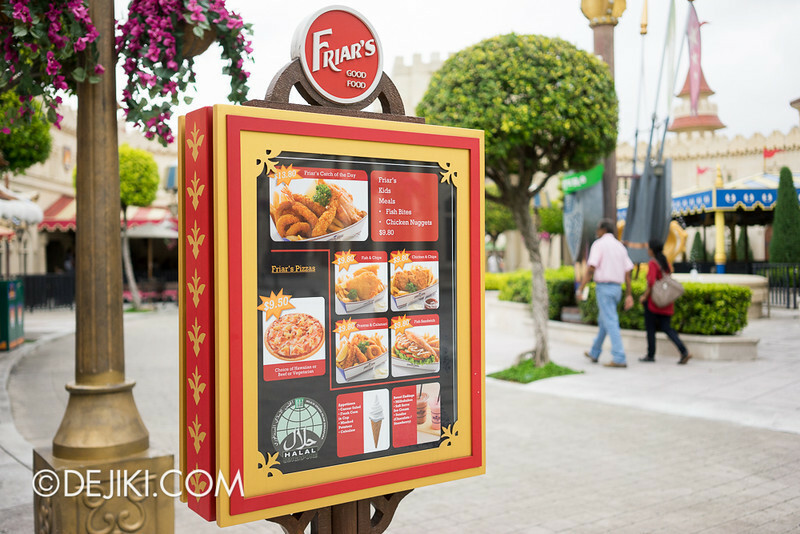 I really miss the old Friar’s (probably pre-2012) where they served wraps. Now, with a menu of fried meat and chips, it is more like an extension of Goldilock’s across the street. 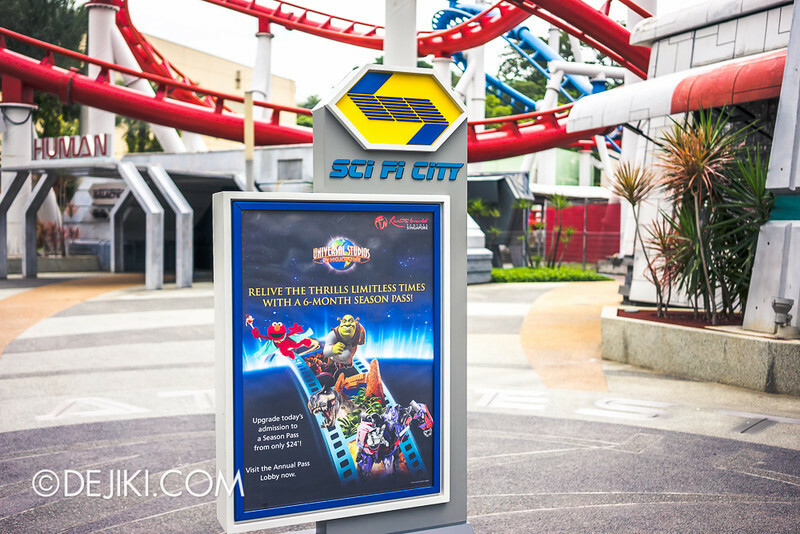 Some new poster stands have appeared in the park. They are nicely themed! Here’s one at Sci-Fi City. Although personally I wouldn’t be convinced to buy anything when this poster is placed right at the middle of the Battlestar Galactica floor emblem. I’ll end this post with a nice photo of The Cruisers performing at Hollywood. 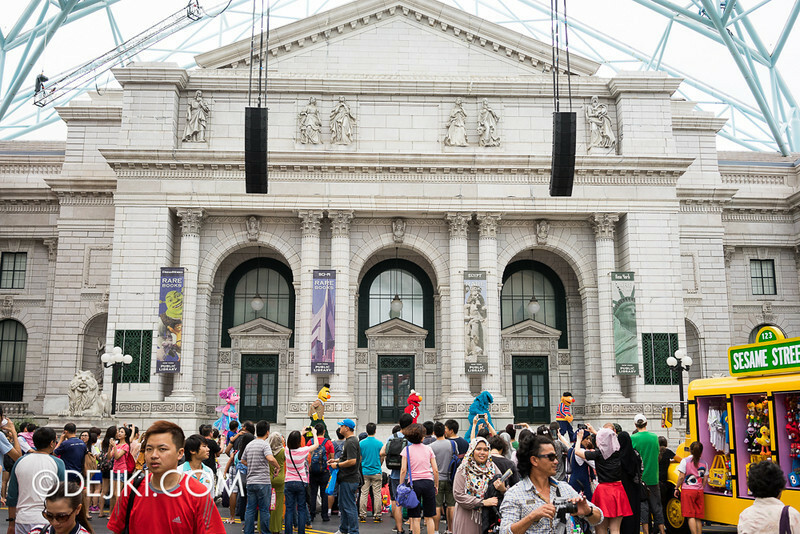 Is anyone planning to visit the park during the Chinese New Year holiday weekend? Sadly, it’s just one of those signs before it became into what happened to pre-1990s Japanese abandoned ghost theme parks. USS really need to step up their game on the marketing and management. 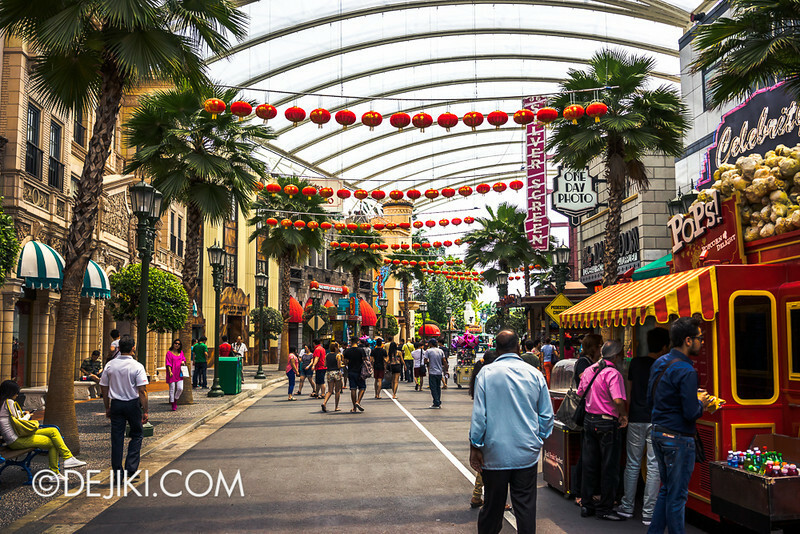 With the SEA economic boom, all upper middle class citizens from south east asian countries would prefer to go to European countries, Japan or the USA if they want to go for theme park holidays. Whilst, the lower middle class is too tight with their money to even buy the merchandises. 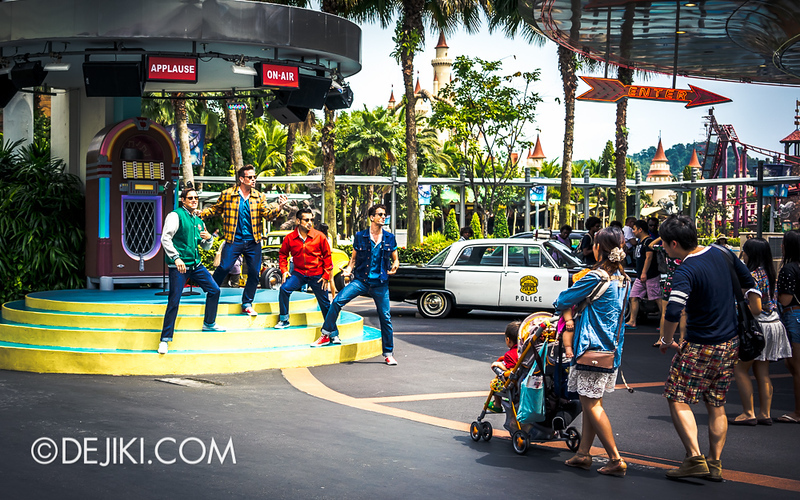 It will be so sad to see another brilliant entertainment project in SEA to go awry. Is it possible to get character appearance timings from park staff for all characters besides the minions? If I may reply on behalf. Character appearances and performances etc. are listed in a list that is printed and distributed (and can be obtained at the entrance). Not sure how else you can see it online, unless somebody actively goes to USS everyday, scan the list, and update on some online site. 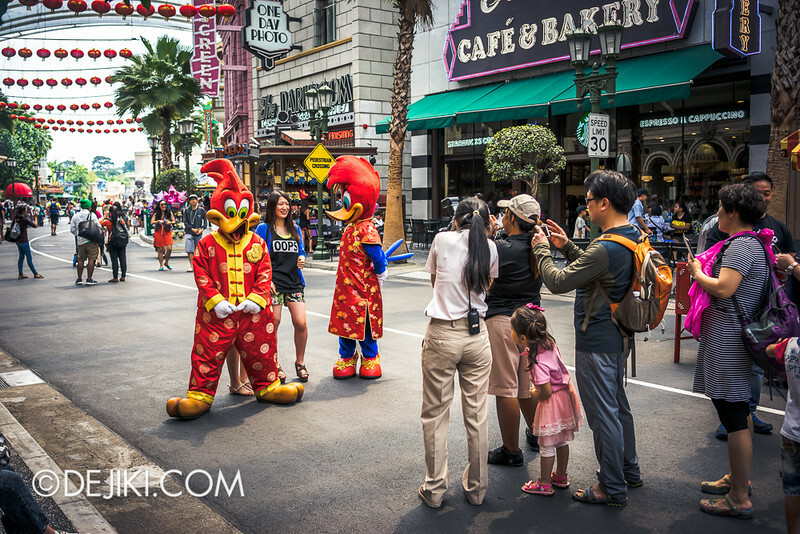 Then again, it just goes to show that everyday is a different day at USS. And everyday brings new surprises for all visitors. I was quite disappointed about the way RWS has been dealing with the Battlestar Galactica issue. And I was equally disappointed at the sorry state of Shrek 4D, in view that some of seats have not been working properly (I am not referring to those stationary ones). Maintenance needs to be more robust, really. I just hope RWS will not forget about this theme park when Genting Highlands is getting a new revamped theme park in the near future. I hope RWS needs to re-look at its oveall strategy as this theme park seems to be losing its glam and lustre gradually. I went today. Kinda disappointed in some rides. shrek 4d as above comment said wasnt working properly n i kinda saw a small line in the screen. not sure if it screen or projector causes it. the battlestar fountain. the one near transformer seem to be in very bad shape. I heard from the staff that a Minion mart is coming soon! a minions own store. 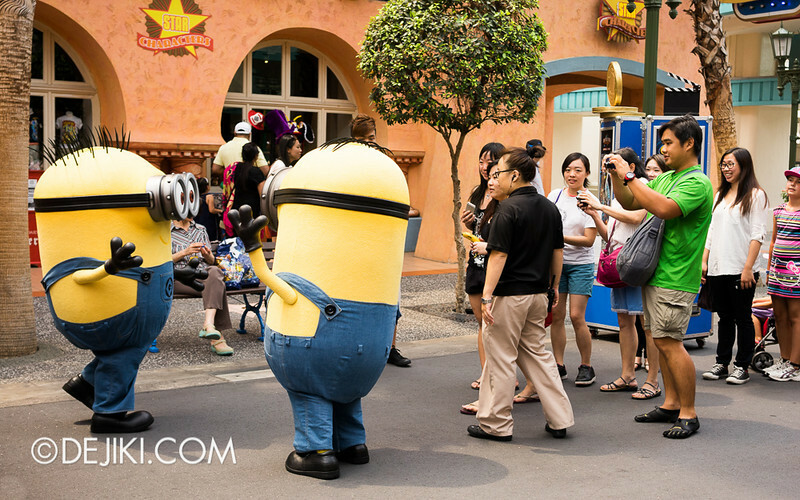 maybe a minions ride coming soon? a minion coaster maybe. but heard betty boop shop are gonna be revamp. the madagascar ride need be revamp as it seem old as it already 3 movies n it still based on first movies. n the river sides can c the paint coming off. n hope they can do a more accesible for wheel chair. as there this guy cant climb stairs n need go out by entrance queue. they having offer 3 tshirt for $59. 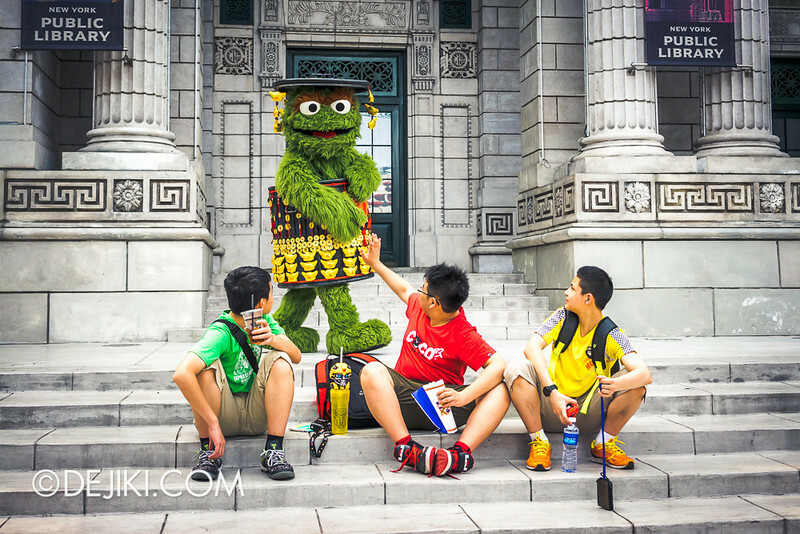 Great to see some angpao in USS, and Oscar seems to be the most inventively-dressed for the lunar new year. 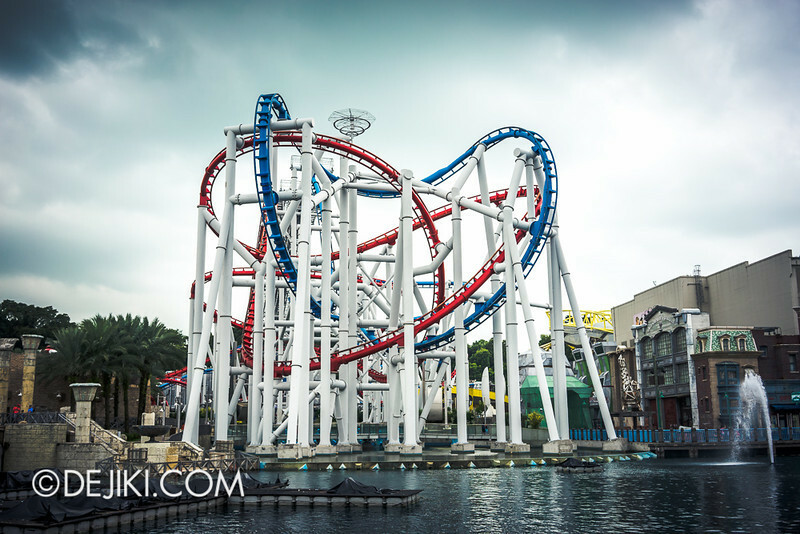 I’ll be in Singapore for a seminar next month, and was planning to drop by USS for the first time, but I’m quite disappointed that Battlestar Galactica is still closed. If that’s the case, is there anything that will make the park worthwhile? I guess Transformers? It is unfortunate that Battlestar Galactica is still closed. 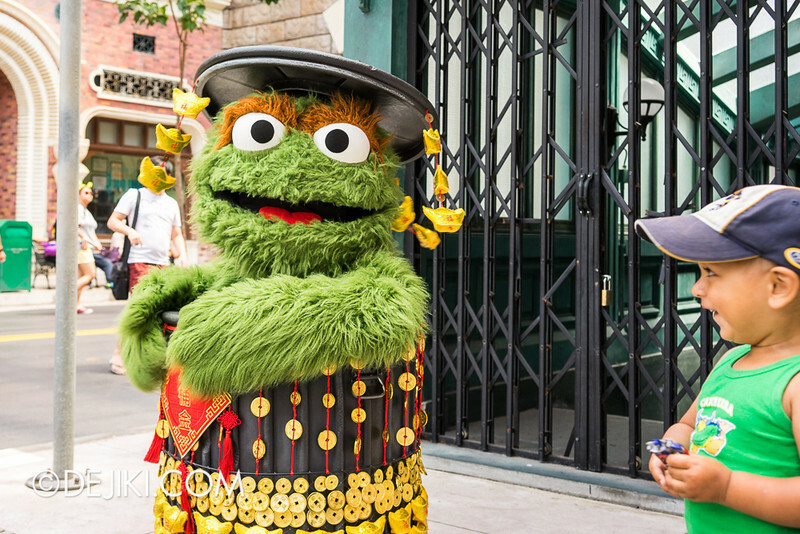 The new updates to the park are more friendly-oriented, with a great focus on Sesame Street. 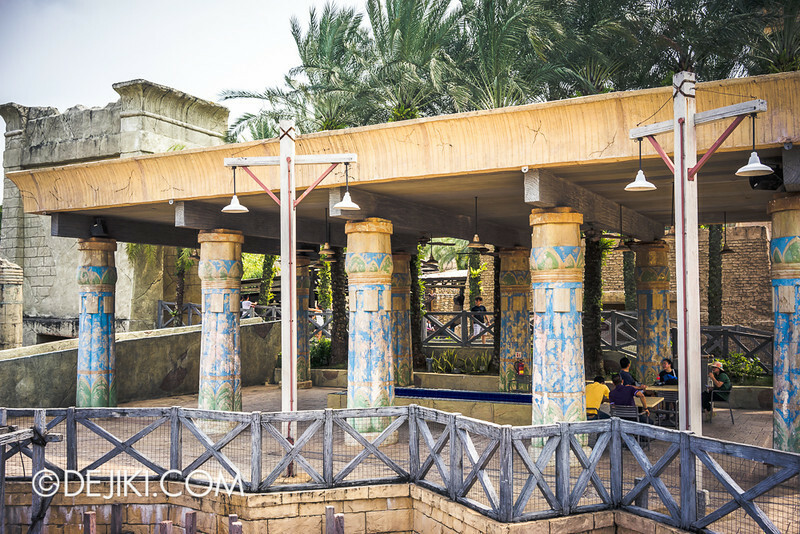 The park has some other mildly thrilling attractions: Revenge of The Mummy, Jurassic Park Rapids Adventure and Transformers: The Ride. It is unclear if BSG will reopen in the near future. The park was strongly motivated to reopen the ride during the first closure, as BSG was the star attraction at the park. 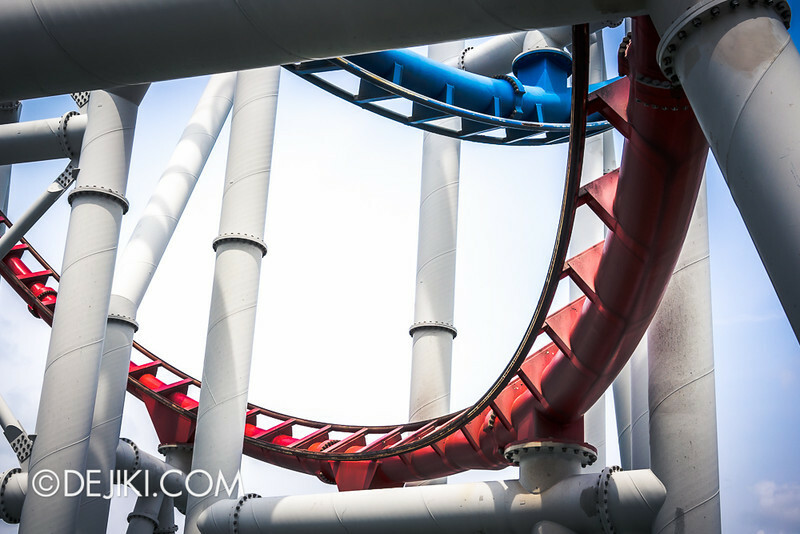 Since then, the interest for BSG has been diverse – especially with the addition of new attractions. 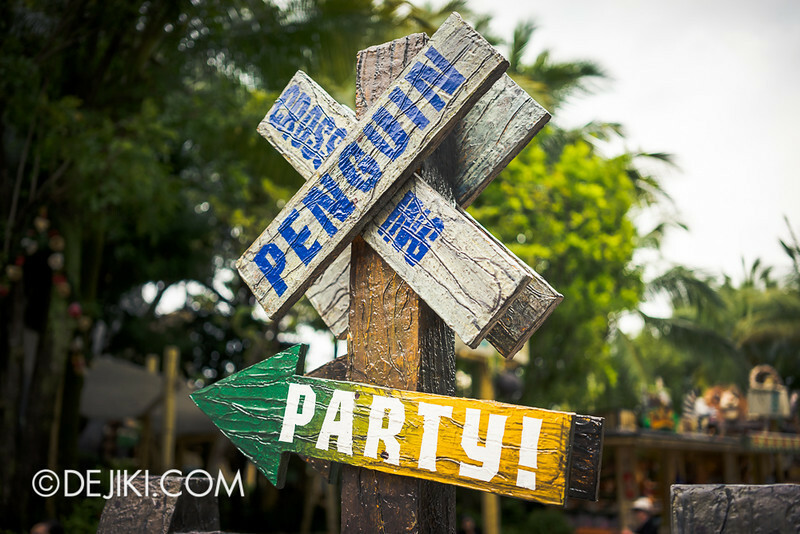 In short, it does not appeal to the majority of park guests. I would say that with the recent closure, the park management has been reviewing the financial viability of keeping this attraction running. BSG is a goner . They lost the License due to safety issues . Seat flew out again during test. So in order for Bsg to reopen they must tear it down and redo it Which is not going to happen.